The first public radio station in western New England, WFCR Five College Radio has provided a mix of high quality, locally-produced and nationally syndicated programming since May 1961. In 2012, the station reached over 175,000 listeners per week, with a mix of classical and jazz music, news, and entertainment. 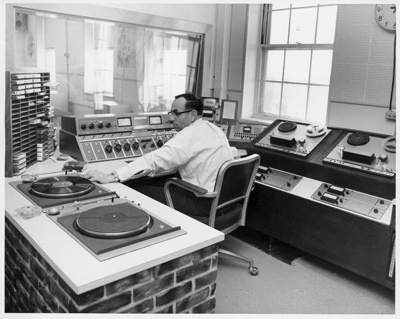 The WFCR Collection contains nearly 4,500 reel to reel recordings of locally-produced radio programs, reflecting over fifty years of the cultural and intellectual life of western Massachusetts. Drawing upon the talents of the faculty and students of the Five Colleges (Amherst, Hampshire, Mount Holyoke, and Smith Colleges and UMass Amherst), the collection offers a remarkable breadth of content, ranging from public affairs to community and national news, cultural programming, children's programming, news and current events, scholarly lectures, classical music, and jazz.